No Name Bars & A Cookbook Giveaway! When Gordon Ramsay, one of the judges for MasterChef, first met Whitney Miller, her humble and soft spoken attitude was said to make Gordon think "she was a sweet lamb heading toward inevitable slaughter. 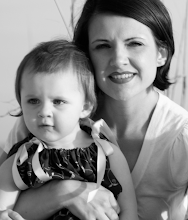 "2 Yet, I believe they strongly underestimated the southern belle from Poplarville, Mississippi. In the end, with a dish of fried chicken and creamed collard greens, Ms. Whitney Miller became the winner of Masterchef. Since Masterchef, she has gone on to open a successful cafe and catering business and has written her first cookbook, MODERN HOSPITALITY: Simple Recipes with Southern Charm. I was honored to be asked to review Ms. Millers cookbook. The cookbook is simply stunning. There is a beautiful shabby-chic appeal in all the page coloring and food photography. 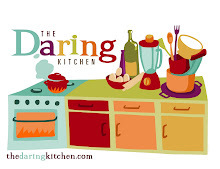 Lots of interesting vintage linens paired with mouth watering recipes. I love Whitney's merging of her favorite recipes with the beautiful southern table settings. The lovely bone china tea cups filled with her Game Day Chili (on page 46), is perfect example. It's what her cookbook is all about. Modern hospitality... mixing the old with the new and embracing southern charm at its finest. Preheat oven to 350 degrees. Grease 9x13 baking dish. To make the crust: Mix the butter and white sugar together in a med. bowl. In another bowl combine the flour, baking soda, baking powder and salt. Add flour mixture to salt mixture and mix until combined. Spread into greased baking dish. Beat cream cheese with mixer until smooth. Add the eggs and mix. Stir in the melted butter and vanilla. Add powdered sugar. Spread on top of crust. Bake for 38 minutes. Let cool at least 5 minutes before cutting into squares. 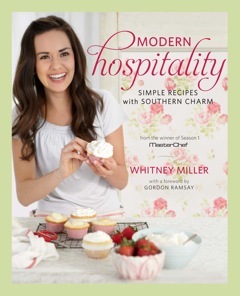 If you'd like to win your own copy of Whitney's cookbook MODERN HOSPITALITY, you are in luck. 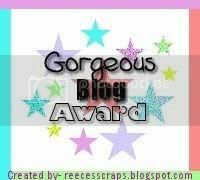 Along with my review copy, I was offered the chance to giveaway a copy to one of my Sinful Southern Sweets readers! So, its very simple, just leave me a comment, any comment (well, preferably a nice one:). You can leave up to 3 comments per day. The giveaway will end August 7th. Winner will be chosen randomly. Please make sure to include your email if its not listed in your profile. Good luck!! Do you ever have days when you just want to consume your entire caloric expenditure in junk?? Ok, so not this week, but its only Tuesday. 1)Chocolate Covered Pretzels, 2) Mars Candy Bars (which I completely forgot existed until I was scouting out the candy isle at Walmart one day) 3)Caramello Bars (Oh how I love thee...) and 4) Potato chips (you can use the light/fat free potato chips if it makes you feel better). 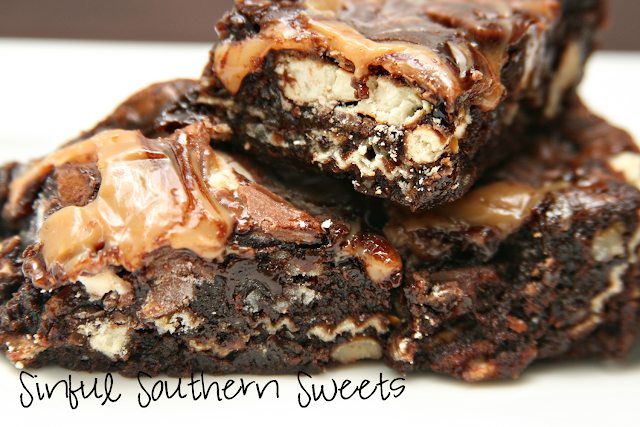 Its all baked in a Ghiradelli Caramel Turtle Brownie Mix. Yes, I kid you not. Its all in there. So, if you're serious and you've never wasted all your daily calories on junk food....well, my friend, its never too late! Preheat oven to 325 degrees. Mix together the brownie mix (set aside the caramel packet), egg, oil and water. Into a greased 9x9 pan, spoon half the brownie mixture. Top brownie mixture with Mars bars, potato chips, choc. covered pretzels and caramello bars. Spoon theremaining brownie mixture over previous layer. Drizzle caramel (from brownie mix) over the top. Gently swirl into mixture. Bake at 325 degrees for 36-40 minutes. You can turn on nearly any news channel and see countries around the world battling it out for what we all take for granted...Freedom. We have no real concept of what these countries experience on a day to day basis. For the last 235 years, we have had men and women leaving their families and loved ones to defend our country so that we do not ever have to know what a country without freedom is like to endure. It was once said "This country isn't perfect, but the concepts on which this great nation were founded - life, liberty and the pursuit of happiness - most certainly are." While you're celebrating and grilling out and having a relaxing and enjoyable fourth of July weekend, lets all remember those men and women that have fought and continue to fight to keep our country free. OK, so now that I'm off my patriotic soapbox, lets talk recipes. Its the day before the 4th. So, you've still got time to wrap up your sweet treat for tomorrow. Today's recipe is easy enough that it won't keep you in the kitchen all day, so you can make it today and relax all day tomorrow. Really, you could make it tomorrow and still enjoy the day. OK, and if you're just a complete bum, you could go to the grocery store and buy one of the huge pre-made cookies from the bakery section. 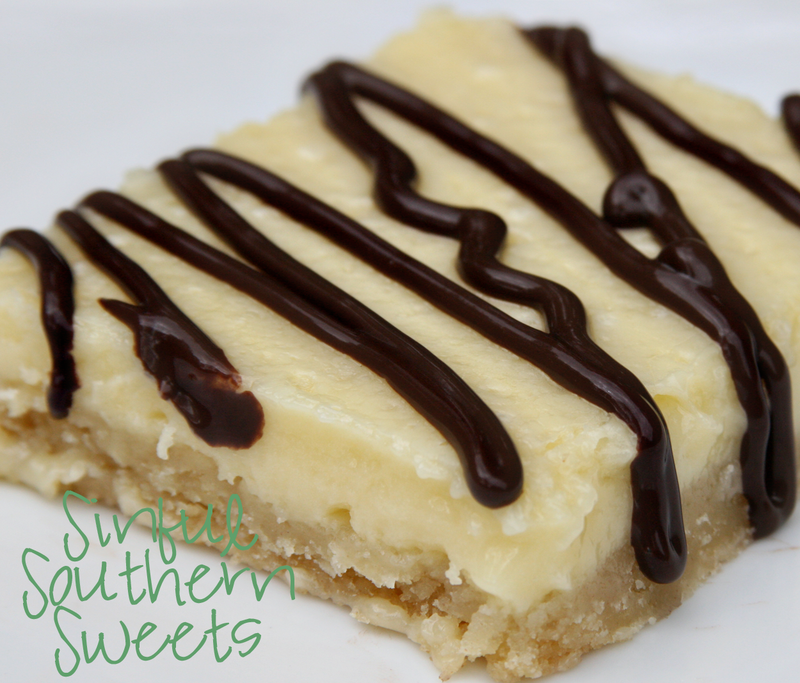 Scrape off the icing and start building on your cookie. 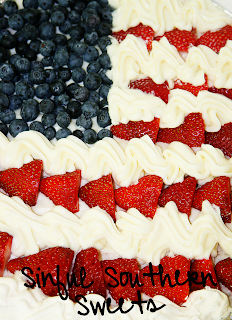 Whichever way you decide, I hope you have a sweet and safe 4th of July!! Crust: In a bowl, combine the flour and confectioners' sugar. Cut the butter into the dry ingredients until crumbly. Press the mixture onto a greased 12-in. pizza pan. Bake at 325° for 10-15 minutes or until the crust is lightly browned. Let cool. 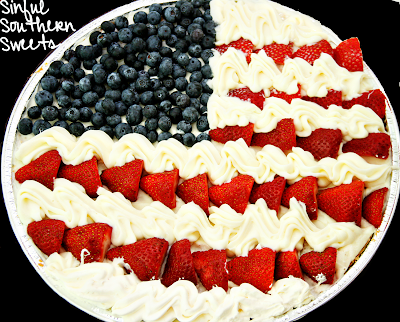 American flag: In a bowl, beat the cream cheese and sugar. Add the vanilla and lemon juice, mixing until smooth. Spread 1 cup cream cheese mixture over the crust. Set the remaining cream cheese mixture aside. Referring to the photo for position, arrange five rows of strawberries on top of the pizza to create the red strips of flag. Place the blueberries in the upper left corner. Cut a hole in the corner of the plastic or pastry bag and insert the star tip. Fill the bag with the reserved cream cheese mixture. For the white stripes, pipe a zigzag pattern between the rows of strawberries.